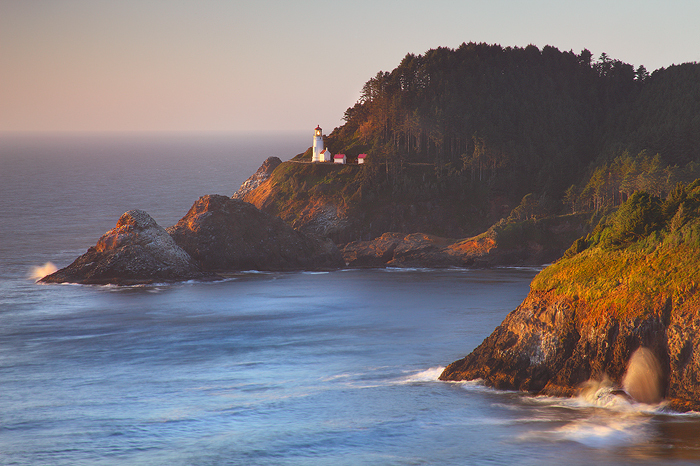 At well over 100 years old, the Heceta Head Lighthouse still stands proudly on the rugged rock cliffs of the Oregon Coast. I took somewhere around 500 photos trying to get this exact scene. I was hoping to get the waves crashing in the foreground and on the point, while at the same time getting the light in the image as it came around during its rotation. To my surprise I actually captured all three in one frame. I can't complain about how long it took me to get the exact shot I wanted though. It was a warm breezy gorgeous night. The entire time I was shooting, sea lions surfed and barked in the waves far below.